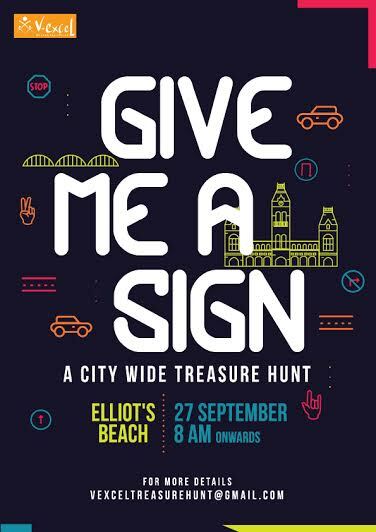 ‘Give Me A Sign’ is a city wide treasure hunt organized by V-Excel. The treasure hunt is going to be held on 27th September 2015, Sunday. The treasure hunt would begin at Besant Nagar Beach, Chennai and each team would be given clues, which would lead them to their next location. Each team would be made to perform high energy, crazy tasks at different locations before their next clue is handed over. V-Excel Educational trust is a NGO committed to the education and rehabilitation of individuals with mental and developmental challenges. Their goal is to empower children and young adults with special needs and disabilities to become dignified independent and contributing members of the main stream society. They have been working on and making significant changes in the lives of individuals we serve. Creating and spreading public awareness about V-Excel educational trust. Educate people about the learning methods used by differently abled children. Facilitating inclusion of differently abled in the mainstream society. Help raise funds for the trust to improve the quality of education of the students. Posted in Chennai and tagged Events.